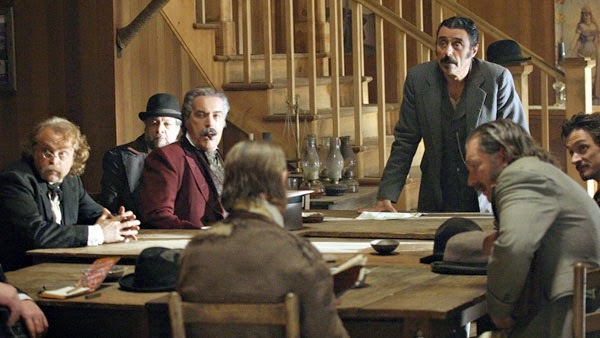 Deadwood Watch, Episode 1.9: "No Brothers and Sisters"
When you watch your boss torture and murder two people, it’s hard to resume business as usual. Bella Union has lost collaboration among its leading trio. When Tolliver and Sawyer (Ricky Jay) are arguing loudly in front of patrons, that isn’t a good sign. It’s taking an iron fist to keep everyone in line, and even an intimidating force like Tolliver can only keep it up for so long. Stubbs is looking for another location for a brothel in town, and seeing the mess of humanity (plus the hungry pigs) doesn’t leave a great impression. Her only positive moment is a chat with Charlie Utter, who’s also trying to strike out on his own. They’re both misfits in Deadwood and don’t really belong with guys like Tolliver and Swearengen. Can they find a niche within the madness? Utter seems lost without Hickok, but his postal service isn’t a terrible idea. With annexation on the horizon, bringing more civilized benefits to the chaotic town is a wise move. Rapid change is coming, whether everyone likes it or not. The relationship between Alma and Bullock grows more interesting, though a future is unlikely. Once he sends for his wife and son, he’s acknowledging that going any further is dangerous. The choice is probably due more to his feelings for Alma than increased safety. There are still plenty of dangerous folks in Deadwood, so it’s risky. Alma’s improved purpose is largely due to her interest in Bullock, so her next steps will be interesting. He introduces her to Ellsworth (Jim Beaver) to assist with the gold claim, and the less-refined guy brings out the charm. The revelation about Bullock’s wife being his brother’s widow does raises doubts about their relationship. Did he marry her out of obligation? If that’s the case, Alma may still have a chance with him. Speaking of a love connection, Sol Star has interest in Trixie. Her rebuttal makes sense, though it isn’t clear where she’s headed. Swearengen treats her better than his other employees, but she still works at his brothel. The major event is the meeting to establish a “government” to keep Deadwood in place after annexation. The usual suspects are there, and there’s little interest in running the town. When you make a goofball like Farnum mayor, it says a lot about the mission. I love the way that Swearengen begrudgingly deals with having to go through the motions and pay serious bribes to maintain his business. Ian Mcshane is so good at revealing the anger behind what seems light-hearted on the surface. He’s uncovered the comic side of the character as the season’s moved along and become a lot more than an imposing villain. Now that Tolliver has taken that spot, Swearengen becomes the more likable alternative to run the town. He isn’t growing soft yet recognizes that you sometimes need to become friends with your enemies. Bullock is nothing like him, yet they still can work together. An example of Swearengen's humor is the piano arriving while he’s asking guys to pay bribes. His conversations with Dority show the absurdity of it, but it fits the surreal feeling behind this government. Bullock becomes the commissioner of the board of health, though his move to volunteer for sheriff is interesting. I’ve been expecting him to become the town law enforcement for a while, though predicting this show is foolish. I didn’t expect Calamity Jane to head into the sunset, and she’s apparently leaving Deadwood. I’m hoping this is a temporary move because she’s one of the most entertaining characters. Robin Weigert goes way over the top, yet we still see the heart behind all of it. She’s fed up with the depravity and can’t get over the loss of Hickok, so leaving makes sense. 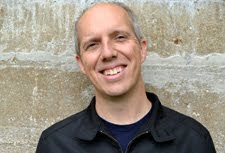 Reverend Smith (Ray McKinnon) can barely get around town due to the seizures. Without a bond with God (and smelling rotten flesh), his demeanor moves further from reality. He finally gets inspected by Doc Cochran, but that provides little respite. McKinnon is giving his all into this role, but I’m ready for them to move his story forward. We’ve been watching similar behavior from the guy for too many episodes. This town does crazy things to people; Sawyer and Tolliver have worked together for 17 years. Deadwood brings out the evil side in men with a different perspective on morality. If no one is around to punish criminals, it all comes down to personal choice. The line between right and wrong is different for everyone, and Tolliver’s line barely exists. Sawyer is just a few steps from joining Flora and Myles with the pigs. That’s a frightening prospect for anyone ready to stare down the devil. Gotta ask, are you surprised Ellsworth is still kicking after the Reconnoiter episode? He did bumble his way through talking to Dority, but I didn't feel like he was going to be killed. Part of it might just be Jim Beaver, who's too good of a character actor to kick off the show. I thought the whole scene with Bullock/Alma was awkward, specifically bringing up that his wife is his brother's widow. It just seemed to come out of nowhere. I have a feeling his wife and son won't make it to Deadwood one way or another. It really doesn't seem like a good idea to bring kids to this town... at least not right now. I'm with you on the reverend. I'm having a hard time maintaining interest in his character, though I do get a kick out of the others bashing him for various reasons. Also curious where the Tolliver/Sawyer arc goes. That was one uncomfortable discussion, especially since it was right there on the floor. It seems like they're setting up a conflict in the future when Bullock's family arrives, but it's hard to say. I think that Sawyer is in way over his head; you do not want to mess with his boss.